I could get used to this. I’ve got a mojito in one hand, a plate of freshly seared tuna in the other and I’m surrounded by an idyllic vista of azure water and sandy atolls. Attentive crew wait on my every whim, there’s a frighteningly fast jetski at my disposal, not to mention three luxuriously appointed cabins should I need to take a nap. This is how the other half live. Sadly, I’m not in that half. I’m only on board for the afternoon but for the fortunate few, the 26m MV Bel Mare catamaran can be chartered for anything from a day to a month. Custom-built in New Zealand and one of only two of its type in the world, it’s a floating haven of polished wood, blinding white fibreglass and gleaming stainless steel. 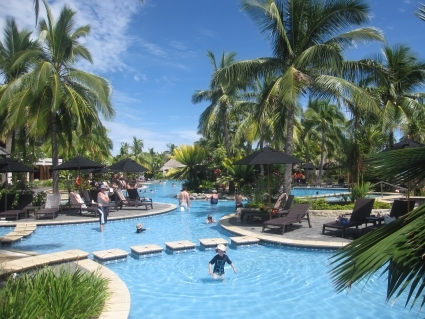 If you want to see Fiji in style, this is how. This entry was posted in Fiji and tagged Fiji by Rob McFarland. Bookmark the permalink.